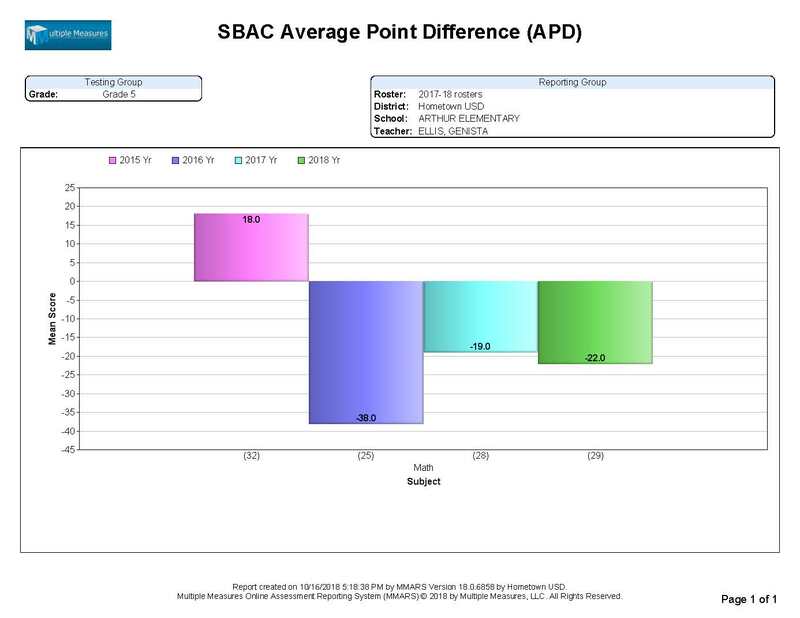 This report compares the change in Fractional Performance Level™, and is available in many different JUX™ orientations. Measures fractional changes “between the bands”. 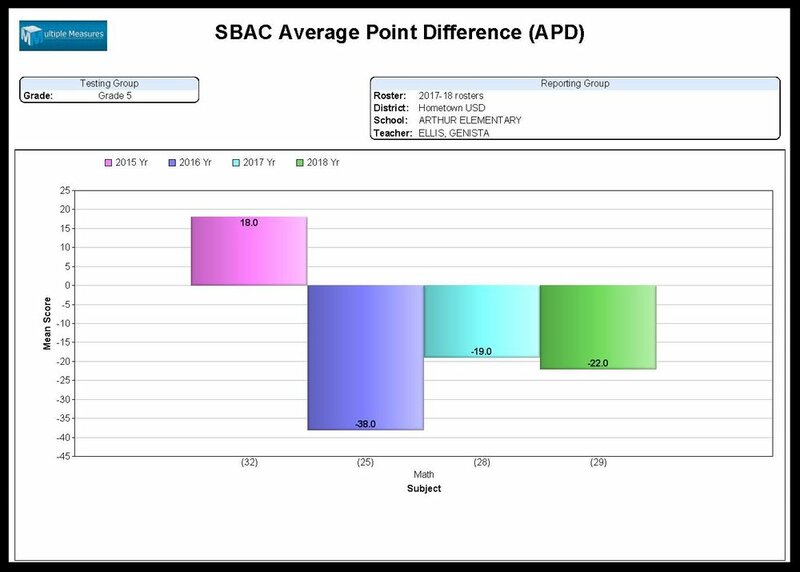 This report compares the change in Distance From Standard for any given set of students, and is available in many different JUX™ orientations. This report compares the Achievement of a set of students by various JUX™ orientations. 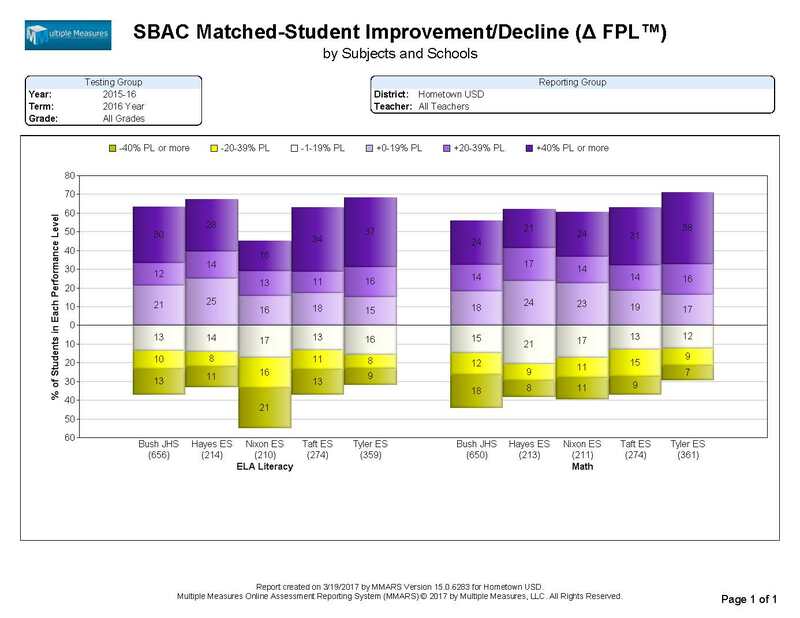 The achievement in this report shows the gains and losses in percentages of students who were above or below standard. This report compares the achievement of a group of students, by various JUX™ orientations, in terms of Below Standard or Met or Exceeded Standard. 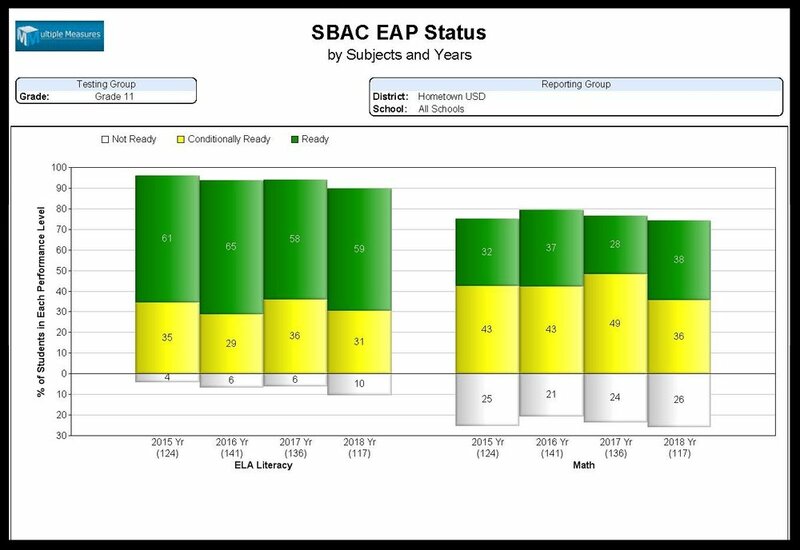 Students with a 1 or 2 are considered below standard, where students with a 3 or 4 have met or exceeded. 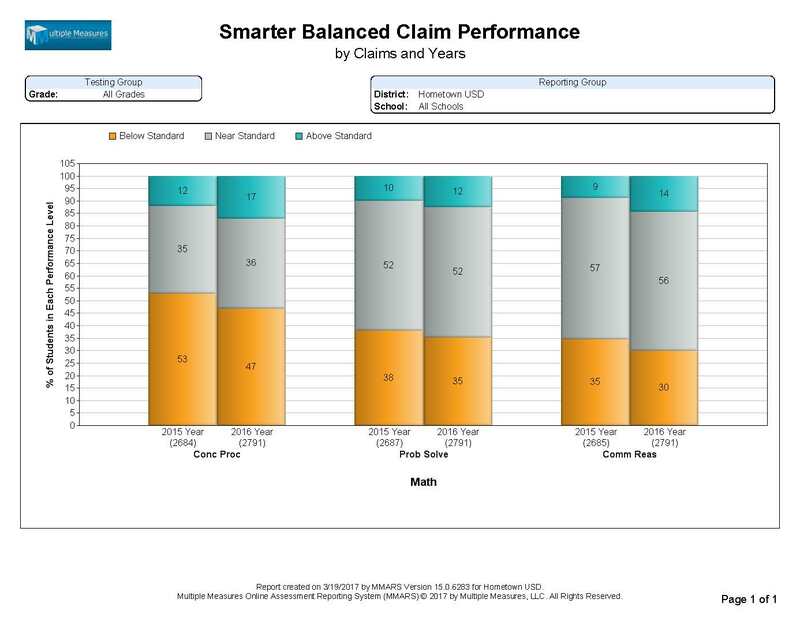 This report compares, for each Claim, the achievement of a given set of students. Available in many JUX™ orientations, students are displayed as either below standard, near standard, or above standard. This report classifies a given group of 11th grade students as either not ready, conditionally ready, or ready for a California State University, and is available in many different JUX™ orientations. 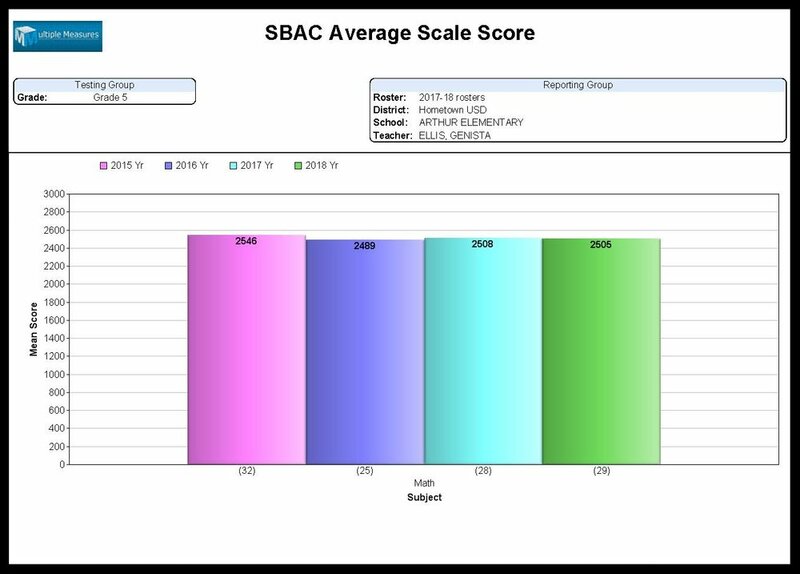 This report compares the average scaled scores for multiple years side-by-side, for Genista Ellis’s 5th grade class. The report averages all of the scaled scores for a given set of students, and compares them across multiple years, at a classroom level. 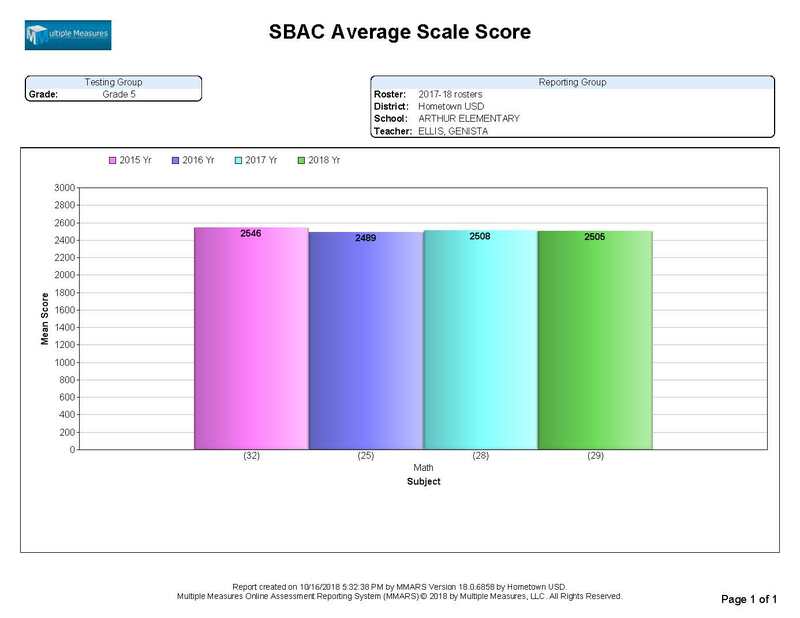 This report lists the Change in Fractional Performance Level™, alongside the subject and claim scores for a given group of students. 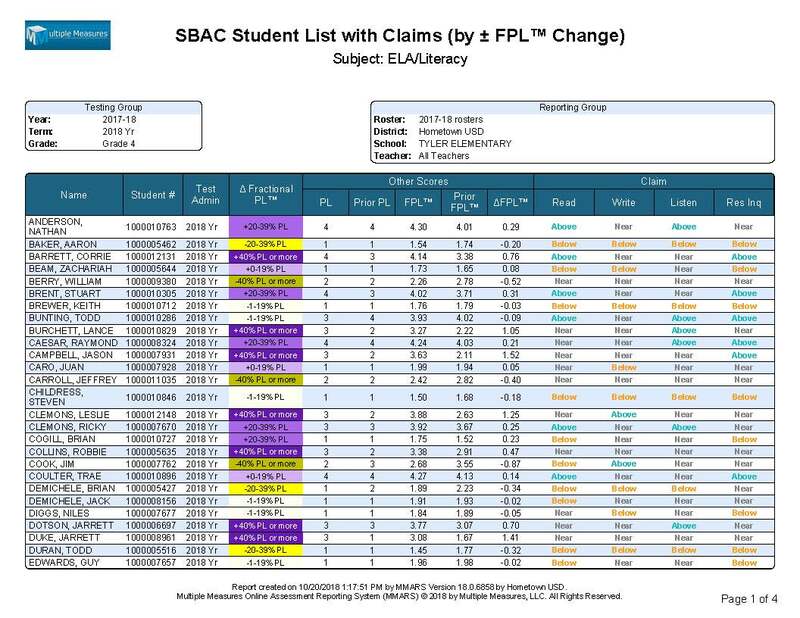 The FPL™ measures change “between the bands,” and can be divided into classroom reports that teachers can utilize. 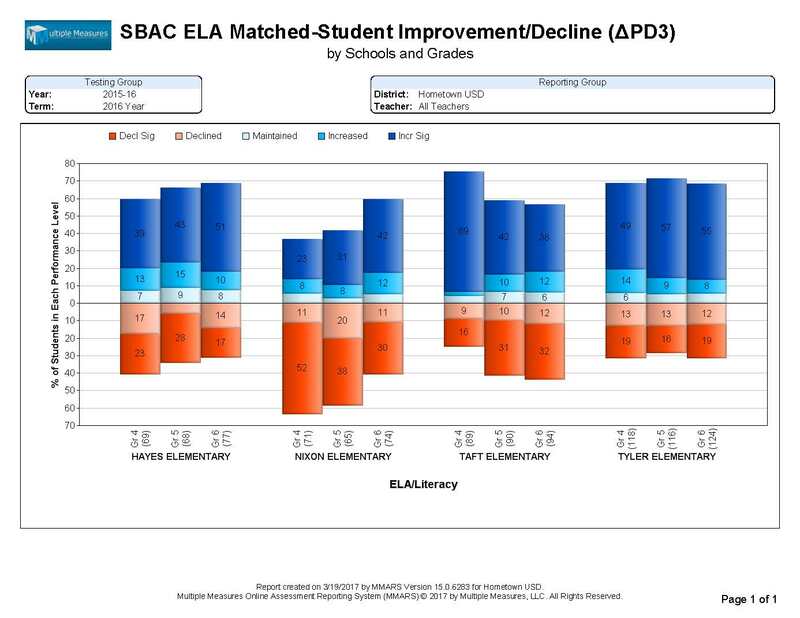 This report lists the Change in Distance From Standard, alongside Math subject and claim scores for all of the students in Krista Avramenko’s 4th grade math class. 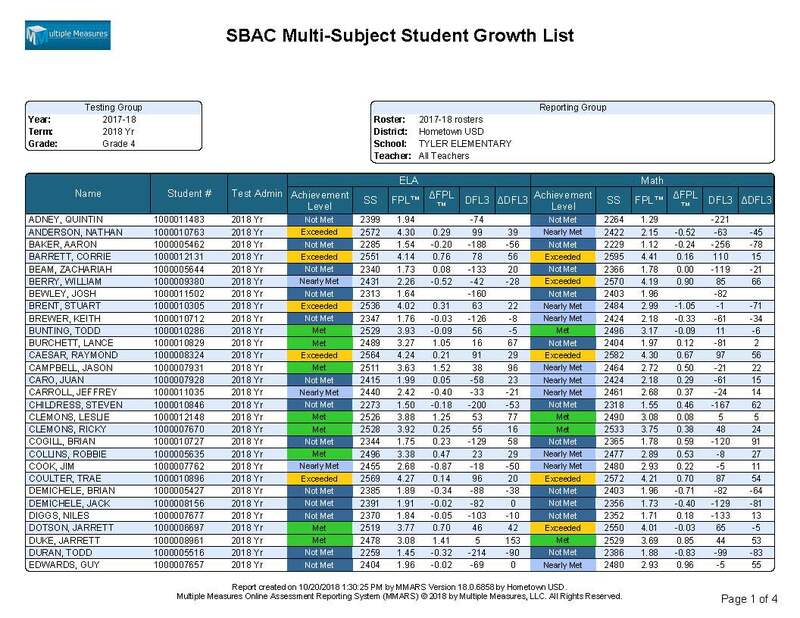 This is an excellent report to provide to teachers at the beginning of a new school year, showing all of the prior year’s change for their incoming students. 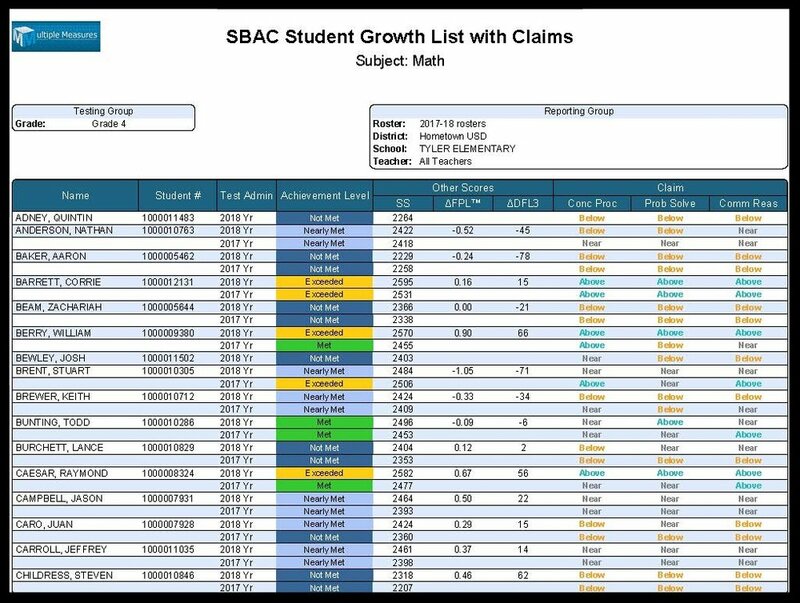 This report lists 2 years of math subject, claim and growth scores for all 4th grade students at Tyler Elementary School. 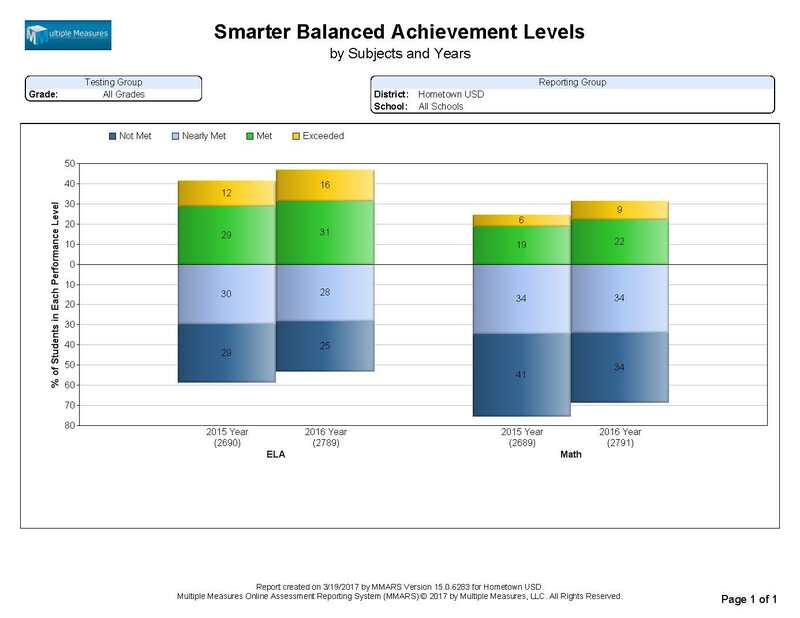 In addition to the Smarter Balanced scores, we provide lists of all the students’ computed change scores: FPL™, ΔFPL™, DFS, and ΔDFS. 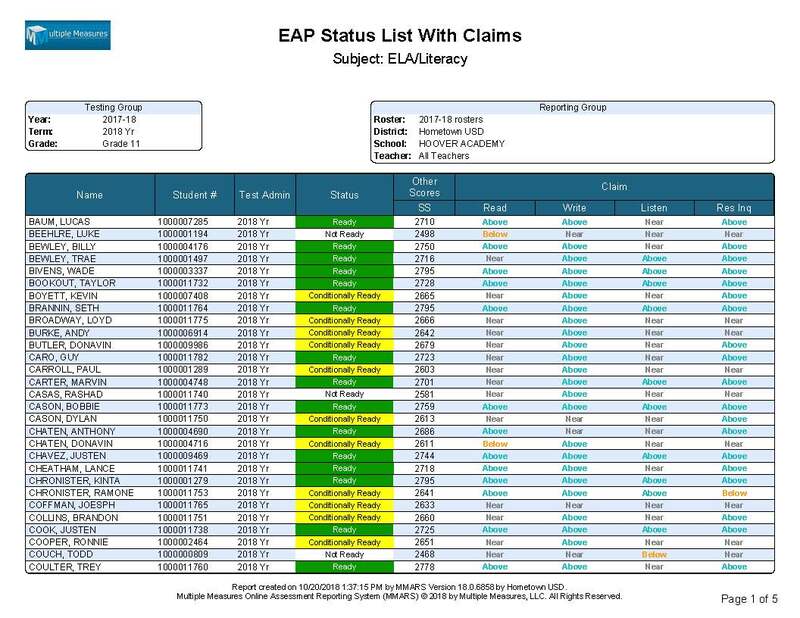 This report lists the most recent year of Math and ELA scores for all of the 4th grade students at Tyler elementary, without claim details. 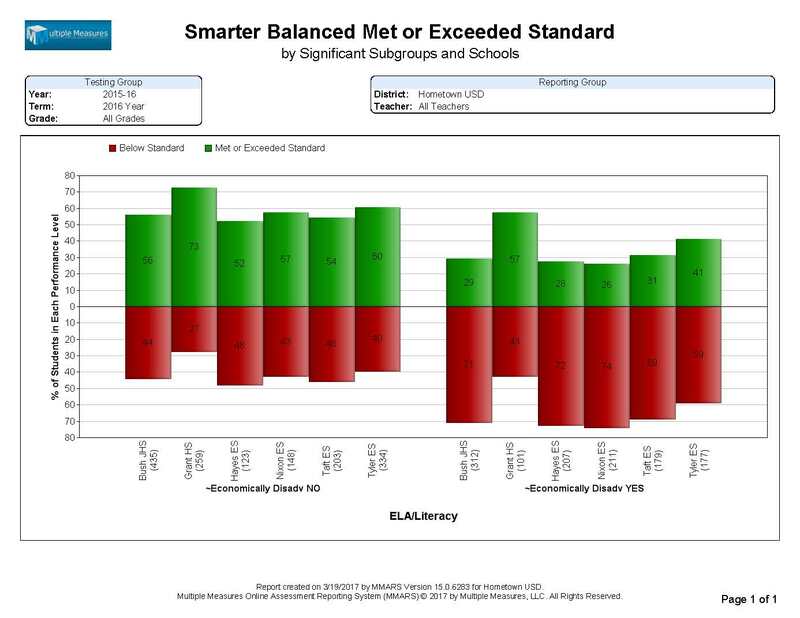 In addition to the Smarter Balanced scores, we provide lists of all the students’ computed change scores: FPL™, ΔFPL™, DFS, and ΔDFS. 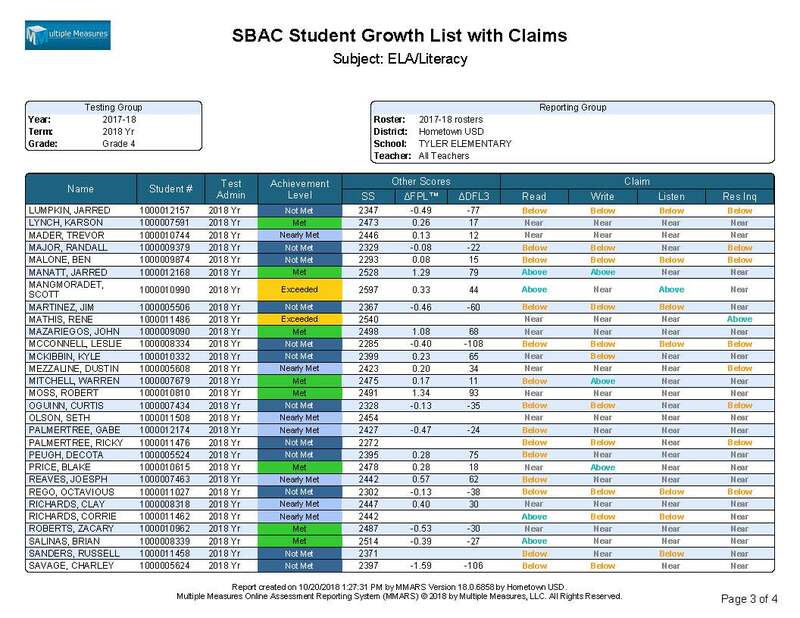 This report lists the most recent year of California State University EAP status, scaled score, and claims for either ELA/Literacy or Mathematics, for a given group of 11th grade students. The status of a student is determined as Not Ready, Conditionally Ready, or Ready, based on their Smarter Balanced performance level. This report lists all Grade 11 students, even those who are “not ready”. 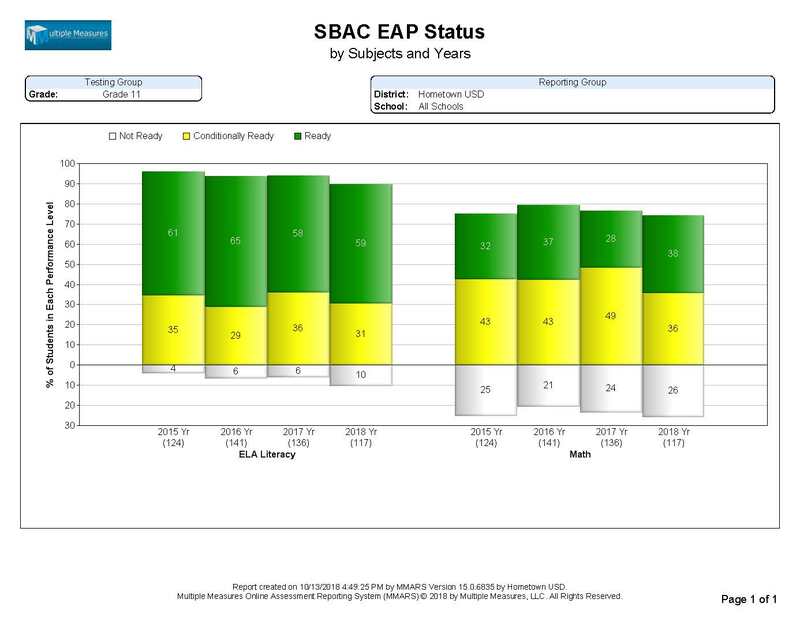 This report displays the CSU EAP status and scaled score for each 11th grade student who met standard in Smarter Balanced in either ELA/Literacy and Math. 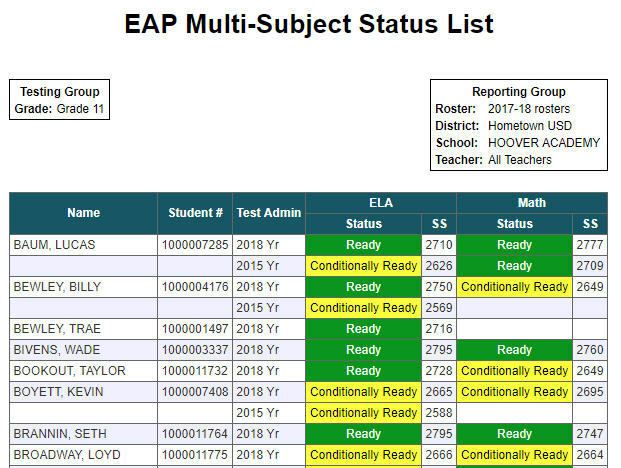 The EAP status of a student is determined as Conditionally Ready, or Ready, based on their Smarter Balanced performance level.